Within any university context, the publication of articles, chapters and even entire books is a common occurrence, among academics. Senior management assistant in the Faculty of Theology and Religion at the University of Pretoria (UP), Tania Arrison, bucked this trend by writing a chapter in a recent publication, titled I Remember Nelson Mandela. The foreword was provided by former president Mandela’s widow, Ms Graca Machel. Having worked for the Mandela Presidency, the Nelson Mandela Foundation and The Mandela Rhodes Foundation, as an office manager, Ms Arrison had the opportunity to interact with Mr Mandela on a number of occasions, and these transformational encounters provided the memories she used to create her inspirational, yet deeply personal reflection in the book. “I remember first meeting President Mandela when I worked at the Presidency in 1994. It was a truly humbling experience. This iconic man, yet so humble and gentle in stature, reassuring us as staff members that it would be a difficult period of adjustment, yet given time and effort we would get through it. I remember that although Madiba did not speak about his faith or religious affiliation, he was a man of great faith. He was keenly aware of how apartheid had been supported by various churches and he had made it his life’s work to reconcile and unite people across race, gender and even religion. I remember that Madiba continuously admitted his own imperfections, sometimes in very public arenas, by stating that he was not a saint, unless one thinks of a saint as a sinner who keeps on trying. Madiba surrounded himself with men and women of integrity, no matter their race or political affiliation. His goal was to bring about healing and reconciliation. I remember the day when Prof Gerwel (formerly from The Mandela Rhodes Foundation) facilitated a meeting about Madiba’s last will and testament where his lawyers discussed some of his amendments. As changes were made, I printed them and I was blown away by the generosity of this iconic leader, who had even made provision for schools, and his personal assistant!" 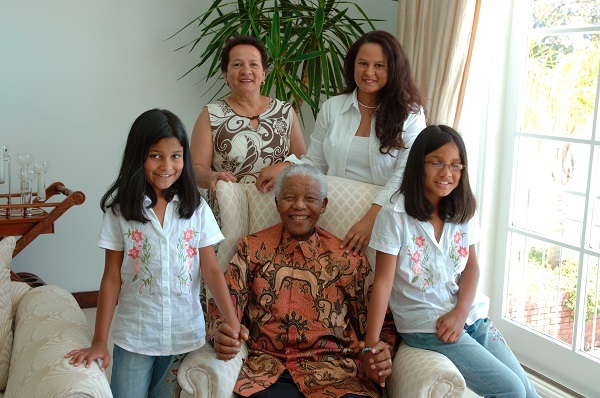 Ashleigh Weideman, Tania Arrison's daughter, who is a Bachelor of Theology student at UP; her mother Louise Kannemeyer, Tania Arrison; and her eldest daughter, Andrea Weideman, who is studying towards her LLB at UP, with former president, Nelson Mandela at the Mandela Rhodes Foundation in December 2006. Originally from Cape Town, Ms Arrison has been a part of the University of Pretoria community for six years, and both her daughters are pursuing their degrees at different faculties within the institution.